Invisalign system is hard to beat. Using a series of clear, removable aligners to straighten teeth instead of metal braces, Invisalign allows you to straighten your teeth without a latticework of metal, allowing for virtually invisible orthodontic treatment – and because you remove the aligners to eat, you can still enjoy all your favorite foods. But it’s actually possible to make treatment with Invisalign even more convenient. When combined with an accelerated treatment program like Propel or AcceleDent, Invisalign offers all the advantages of convenient treatment as well as a reduced treatment time. As a premier orthodontist serving the Toronto area, City Orthodontics is proud to provide Invisalign, Invisalign Teen, and accelerated orthodontics at our office – so you can straighten your smile using the most convenient form of treatment on the market. 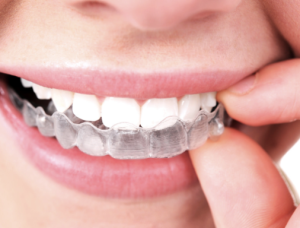 The Invisalign system is a revolutionary alternative to braces, and it’s gained massive popularity as an orthodontic treatment for good reason. Invisalign aligners are virtually invisible when worn, and the ability to still enjoy your favorite foods and maintain oral hygiene normally give it a huge advantage compared to braces. But when Invisalign is combined with accelerated treatment, things hit a whole new level. Accelerated treatment methods like AcceleDent and Propel Orthodontics are simple, convenient, easy-to-use devices that have been clinically proven to cut treatment times by up to half. These devices use tiny vibrations called micropulses to stimulate the jawbone and gently, safely speed up the movement of teeth. All they require is about 20 minutes of use per day, and your hands are still free while you’re using them, so you can speed up your tooth movement while texting, reading, or surfing the web – making it even more of a convenient solution. With the combination of Invisalign and accelerated orthodontics, you can revolutionize your life with a gorgeous new smile without the hassles of braces – and you may be able to do it in as little as six months. Call us today at 416.222.3223 to learn more about this potent orthodontic combination, and if you’d like to get started on your own orthodontic journey, just reach out to us at our contact page to schedule a consultation. We’re looking forward to helping you achieve a beautiful new smile faster and more conveniently than you ever thought possible!